Jungho Oak is an artist of living in Seoul . He has been attracting attention worldwide . He exhibited at Leeum of Seoul "the Samsung Museum of Art" in 2012 , and has joined the Glenfiddich Residency program in the UK in 2013 . He using his own body sometime , he use photos and videos . It has rich in humorous and the elegant expression , but It has the seriousness essential in our daily . 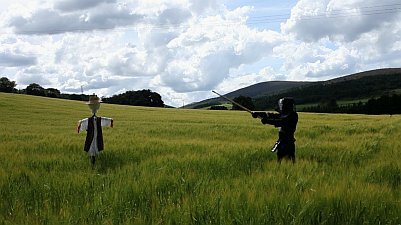 This video works uses the style of Japanese traditional kendo , he play game with scarecrow in a serious attitude . Repeated game is absurdity and humorous , but it is projected with a grand scale in nature and beautiful skies . He is directing the comical culture and aggression swordsman . This works made in Scotland as a residence program in the UK .